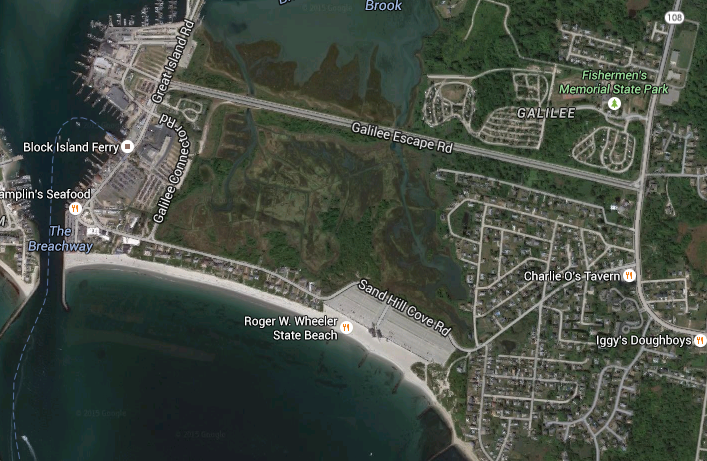 Original post–First noticed reports of an explosion at Salty Brine State Beach in Narragansett Rhode Island on Twitter, from various bots that tweet interesting reports from websites used to monitor emergency services radios. It is a gorgeous, warm summer day in most of New England, as perfect a beach day as you might imagine. Any beach in this region will be crowded, the roads leading to them thick with traffic as well. [Rhode Island Department of Environmental Management] Spokeswoman Rayna Maguire said details are still sketchy, but a 50-year-old woman who appeared to be “trapped” on the rocks had been taken to South County Hospital. There were no other reports of injuries. Maguire said that witnesses reported the explosion was under the sand and blew the woman onto the rocks. A few beachgoers tweeted what they heard or witnessed. There are no indications right now as to the source of the explosion, however since April, 2013, it’s not much of a stretch for New Englanders to assume terrorism is afoot when something like this occurs.